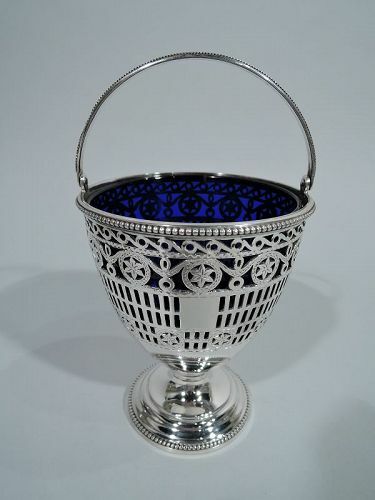 George V sterling silver sugar basket. 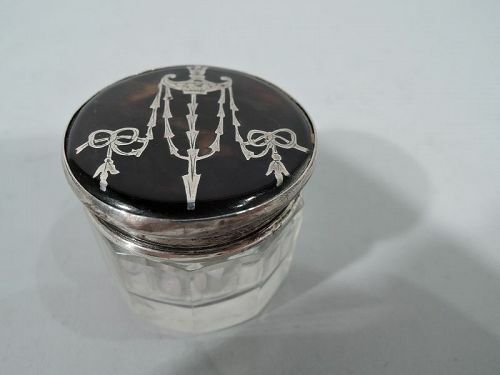 Made by Pairpoint Bros in London in 1913. Ovoid bowl with c-scroll swing handle and stepped foot. Pierced linear and rinceaux ornament as well as rondels inset with flowers. Beaded rims. Rectangular frame (vacant). Cobalt glass liner. Hallmarked. Very good condition. 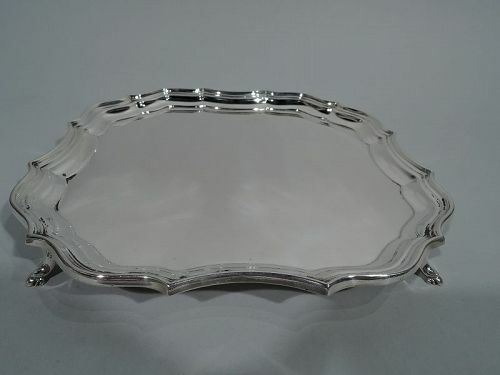 Elizabeth II sterling silver salver. Made by John B. Chatterley & Sons in Birmingham in 1966. Square cartouche with curved sides and concave corners. Molded rim and 4 capped volute-scroll supports. Traditional Georgian form. Hallmarked. Very good condition. 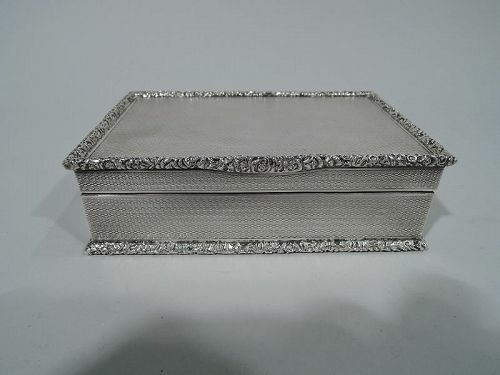 George V sterling silver box. 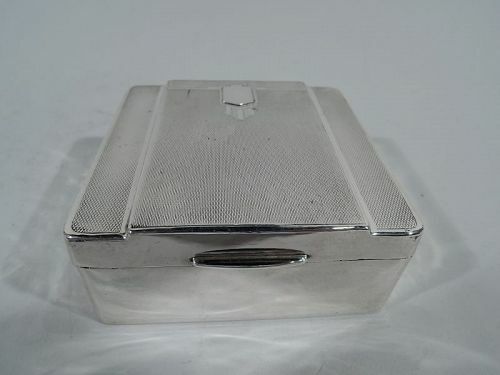 Made by Mappin & Webb in Birmingham in 1933. Rectangular with straight sides. Cover hinged, tabbed, and paneled with allover engine-turned wave ornament and geometric cartouche (vacant) with skyscraper crown. Box and cover interior cedar lined. Box underside leather lined. Hallmarked. Very good condition. 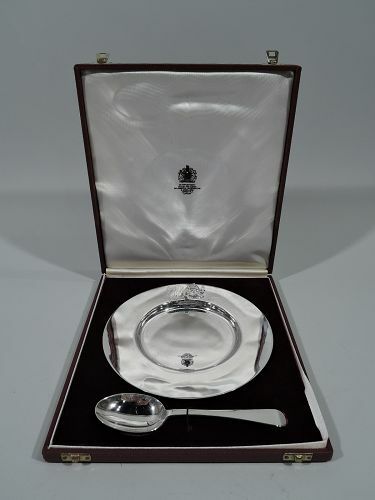 Contemporary sterling silver plate and spoon. Retailed by Asprey in London. 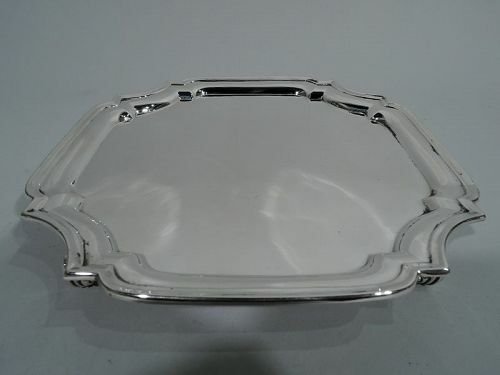 Plate: Round with well and wide shoulder. Applied figure of Humpty Dumpty merrily waving. He is seated on a brick wall (engraved). Spoon: Tapering handle with oval bowl. Leather-bound case with fitted red velvet and silk lining with retailer’s stamp. Both pieces made in 1985. 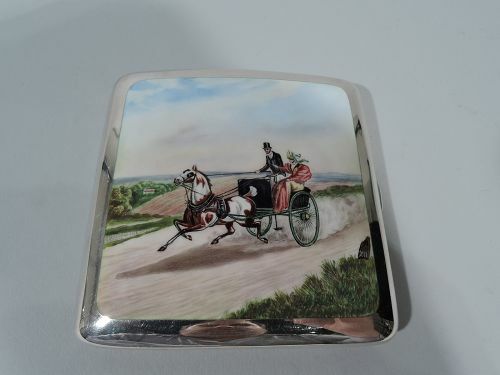 The plate has Sheffield maker’s initials SC. The spoon has Asprey stamp. Very good condition. 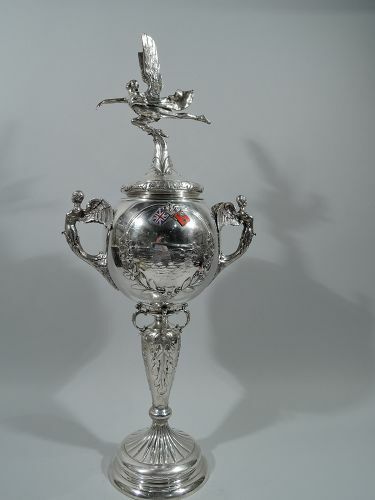 George V sterling silver trophy cup. 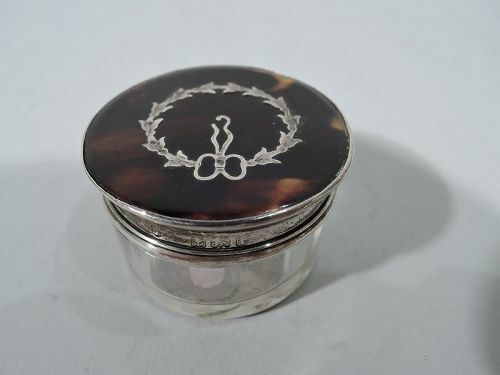 Made by Goldsmiths & Silversmiths in London in 1929. 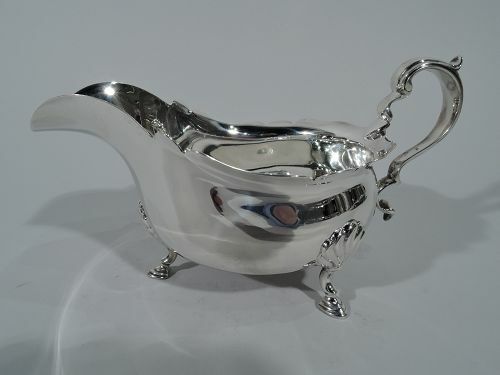 George VI sterling silver gravy boat. Made in London in 1939. Wide-bodied bowl with scalloped rim, helmet mouth, capped-scroll handle, and 3 shell-mounted hoof supports. Traditional Georgian – still vital after more than two centuries. Fully marked with retailer’s stamp (Peter Guille, Ltd). Very good condition. 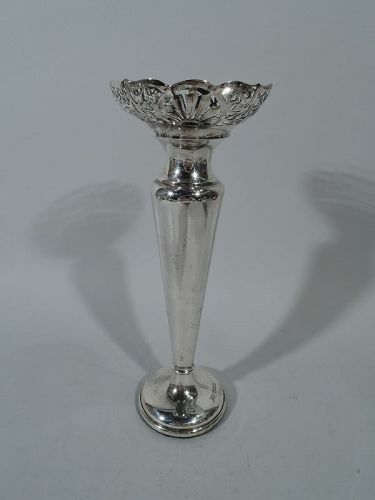 George V sterling silver vase. Made by Walker & Hall in Sheffield in 1915. Conical on raised foot. Skirted rim with pierced scrolls and shells. Hallmarked. Very good condition.